Grind your own spices in the new cast iron "Spice" grinder/crusher from Skeppshult! 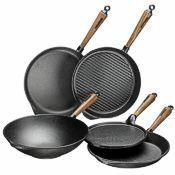 Skeppshult of Sweden manufactures artisanal cast iron cookware and cook's tools from strictly controlled raw materials in their factory in Småland. Made without harmful chemicals, their products have an exceptionally long life span, which explains how they can provide a 25 year cast iron warranty. Their natural and environmentally friendly cast iron products are made without harmful chemicals and require little maintenance. Skeppshult's factory operates the only remaining foundry in Scandinavia making household products in cast iron. Many phases in the manufacturing are still pure hand craftsmanship and dependent upon great professional skill. Undergoing an average of ten quality control inspections before completion, your Skeppshult products will withstand year after year of heavy use. Carl E. Andersson established his foundry on the shores of the Nissan river in 1906. Much has happened since then, but Skeppshult's commitment to fine craftsmanship remains strong. In an age of mass-produced mediocrity, a Skeppshult cast iron piece is a connection to a timeless standard of excellence. A Skeppshult pan or kitchen accessory is both a tool and an inspiration—an investment you'll never regret.